An idol's brilliance illuminates the dreams of humanity. Starlight Academy, a holy ground for celebrities in training, seeks to realize this belief. Behind its rigorous entrance requirements lie not only the top young stars in the entertainment business, but some of the best memories these students will ever have. Whether it be chopping down Christmas trees, traversing obstacle courses, or even rock climbing, there's always a playful new adventure to be found in the world of Aikatsu!. Side story: Aikatsu! Movie, Aikatsu! Music Award: Minna de Shou wo MoracchaimaShow! Summary: Aikatsu! : Dai Starmiya Ichigo Matsuri Zenyasai!! Alternative setting: Aikatsu Stars!, Aikatsu Friends! When I was first taught about "idols" as a child, we knew them as false gods. Then I started watching anime and I realized it's practically the same thing for Japan. Aikatsu! follows the idol trend of the past few years. These are shows about cute young girls singing and dancing that look like they're for young girls but are actually for grown men, only this time around it actually is for young girls (it has some periphery demographic, though). It follows a group of middle school friends led by Hoshimiya Ichigo learning to become idols at Starlight Academy through various "idol activities." But what are "idol activities?" Singing and dancing are definitely involved and, as one would expect, are the primary concern. But that's not all, oh no. Aikatsu! delves much further into the idol world than that which we see on the stage at concerts (and probably further than reality). These girls take long runs, chop down giant trees, scale mountains with their bare hands, and navigate trap-ridden haunted houses. I'm not even exaggerating here, all of those things literally happen in the show. It's no thriller, but there are a few surprising times where you wonder where these girls get the strength and courage to face these obstacles. But being an idol isn't all about training your body, either. Being an idol is also an image and representation. When you become popular, you get fans, and you need to be sure you don't let those fans down; this fact is not ignored. There is a certain episode in which Ichigo becomes overly worried about making a good signature and being able to do it fast when it comes time for her to meet fans and sign things for them. The problem is that she forgets the "meet fans" part, and only focuses on the signing, a fact that is soon brought to her attention by a friend, making her realize that she had been letting fans down who not only wanted to get a signature, but also to simply see her face and talk to her a bit. Further, there's an image to maintain. This is a fine line that could have easily fallen into the territory of shaming non-perfect body types, and even arguably toes the line at best. When Christmas break comes and it's time for Ichigo to go home for a couple weeks, she can't resist her mother's cooking; she eats and eats and gets...big. The people around her are disappointed with her, but not because of her new shape; it is because of how she let herself go, how she allowed herself to be lazy and leave her idol activities at the door step when she came in. At 50 episodes, there's a lot of time to develop story and characters. As one might guess from the above, most of the story is episodic, but there is still a certain continuation to everything. New idols are introduced and have bigger roles in subsequent episodes, a lesson learned in one episode will continue to be put into practice throughout the show, and as our girls get ever more popular both in the academy and in the outside world, things get busier. There are times where we might see a string of slice-of-life episodes followed by a slightly more dramatic story arc, but these never come too suddenly to feel out of place. They start reasonably and end well, with the possible exception of one near the end where it seems as though idol units begin to grow on trees and the viewers are left wondering who belongs where and what this sub-group, should they actually exist, is even doing. Lead protagonist is Hoshimiya Ichigo, with main support Kiriya Aoi and Shibuki Ran. Ichigo is a cheerful girl, always happy, but not always very smart. She decides she wants to do something and she goes and does it, no hesitation. Sometimes things work out great. Other times they don't. She doesn't take these moments for granted, but she doesn't let them get her down; she bounces back, taking what she's learned and applying it for the future. She's the kind of character who just attracts other people to her. But she wouldn't be able to do that without such great friends. First up is Aoi, her childhood friend who showed Ichigo her first idol concert that made both want to be idols and convinced them to apply for Starlight Academy. Aoi is the "idol professor." She knows everything about idols. No, really. Everything. She's also an idol herself and Ichigo's #1 fan and as such, knows how to keep the peppy blonde in check...while occasionally succumbing to the craziness herself. And then there's Ran, the most mature member of the trio. She is first introduced as being popular around the academy for her cold, no-smile demeanor, having a confidence built up due to having years of entertainment experience under her belt before having even entered Starlight Academy. Getting her to warm up to Ichigo and Aoi was not easy, but when she finally allowed them to break the ice with her, we see what is really a very calm and caring personality and an irreplaceable source of confidence, even if she is sometimes the one who needs it the most. But there are a lot of characters here. Kanzaki Mizuki, the aloof and mysterious upperclassman and most popular idol at the academy who only very rarely shows a more emotional side (but don't worry, she does) is the most prominent support. She is the endgame, the goal everyone else is trying to reach, but a rival that always moving ever forward. A lot about her is left in mystery, but we're also given a lot of tidbits that show her to not be the 100% perfect being she's made out to be, and she never lets up, considering that, while she provides motivation for others, those behind her are also what motivates her to keep going. But again, there are a lot of characters, many of whom don't really get a chance to be fully realized. The extra idols with recurring parts, which include Otome, Yurika, Shion, Sakura, and Kaede, largely fall into this group. All of them at least an episode or two dedicated to their development, but afterwards they occasionally may make things feel too crowded and will largely stick to their base personality for the rest of the show without ever really being focused on again. It's a bit of a shame, but it was a trade-off for the extra focus on the show's main group. However, the show doesn't ignore any characters. There are multiple side characters who could easily have been left by the wayside but get their time in the spotlight, such as dance instructor Johnny Bepp (who, yes, does play a pirate in one episode) and Ichigo's mother, father, and little brother. These sessions are largely abrupt, but short and sweet. They really help to develop the relationships all around, giving all the characters more depth, all while not sacrificing the main focus of the show. And what is the main focus of the show? What do you think is the main focus of a show about idols? Music! Oh, we're definitely treated to music in this show. Every single episode climaxes in a concert scene. It's not a different song every episode, but it is changed up enough that by the time you begin to grow tired of a song, they start using a new one. Also, the first ED, Calendar Girl, is amazing and actually well portrays the show's eventual theme. 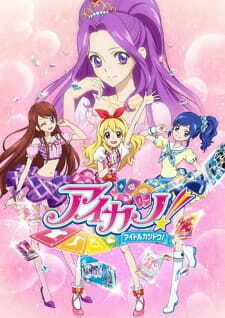 Overall, though, while even Aikatsu!, like others of its kind, may seem to occasionally throw in more songs to advertise new singles, it never really feels out of place within the context of the show because most of what the characters are doing are related to their job as idols and leads up to the eventual musical piece. But speaking of those concerts and advertising...there are some weird things going on. One can't write a review of Aikatsu! without mentioning the forbidden fruit of commercial anime: cards. Aikatsu! too wants to sell you some cards. In the show, these cards are their outfits and are...generated?...in the Aikatsu machine for the concerts. Yeah, it's weird, but it doesn't tiptoe around it. Much effort is spent on matching up each member's outfit with everyone else and getting new cards for new outfits to fit a different occasion, including the special "premium" cards that are only given to the most worthy of idols. At the end of the day, it's hard to say if this was purely an advertisement gimmick, a legitimate-if-strange part of the story, or something in between. There's also this thing they do during concerts called "special appeal." It's hard to even describe what these are since it really isn't grounded in reality at all, but it's this mid-concert thing that typically only takes a few seconds to do and ranges from spinning around wildly to shooting a heart with an arrow. They're supposed to be these things that make a concert and performer more impressive in some way, but it's never made clear what the actual purpose of them is or why they exist at all. There's even an episode focused on them, but all we really learn is that most idols can only do 1 per concert while Mizuki can pull off 3. Around the halfway point of the show they're never really brought up again, but they still appear in the concerts. Things are very pretty (and pink) in Aikatsu! land, but a little rough around the edges. Character designs are distinct and animation is typically fluid, but at the forefront of every episode's concert is a sequence of re-used animation where the girls are inserting their Aikatsu cards into the Aikatsu machine. The concert scenes are all in CGI, which can be a bit daunting next to the 2d animation of the rest of the show (which sometimes even appears for the audience during concerts). A quick eye can see commonly re-used background characters, not really a problem in most cases since I also see the same people every day at school, but the worst offender is a particular scene where the headmistress is addressing an assembly of girls and the two halves, hair color aside, are mirrored, like each girl has a twin sitting in the same position but on the other side of the room. At the end of the day, Aikatsu! is just a happy show. Its run time is used very well, as it doesn't have to crank out material before its inevitable end and viewers are given plenty of time to get attached to the characters without having to leave them so soon. Certain episodes later on in the show really wouldn't have even worked without the kind of run time this show had; the impact they made just wouldn't be the same in a short series. Aikatsu! is also not for everyone. It is a kid's show and even fans who usually like idol shows such as Love Live and Idolm@ster may not be able to get the same enjoyment from this one. Feel free to judge this one by its cover; if a group of young girls in frilly dresses over a pink background doesn't seem like your kind of show, don't watch it. But if you do like this kind of stuff, or just feel like giving it a shot, you ought to like what you come in for. And then there was more. And more. And then a little bit more. But I'll make this quick. Season 2 of Aikatsu, episodes 51-101, aka the dark ages of Aikatsu. Dream Academy, a rival school, is introduced, and with it the most frustrating time for Aikatsu fans. The new characters are poorly developed and seem to be way too talented right out the gate. Where the first season was fine with having characters lose, suddenly we see a bunch of ties happening. There are, however, good episodes in all this. Oozora Akari is introduced midway through and is immediately lovable, overturning everything bad in the rest of the season. Basically, any episode that doesn't have a great focus on Dream Academy characters is at least decent. Season 3 of Aikatsu, episodes 102-153 (somewhere around there, anyway), the Akari generation. There is a new protagonist, and while the old cast is still around, they are now side characters. The producers seem to have realized that everyone hated Dream Academy and more or less dropped them from the show entirely (they appear maybe 3 or 4 more times for the remaining duration of the show). The show goes back to its roots and, despite having a few more rough patches than before, is once again the Aikatsu we know and love (if you've gotten this far, you must love it). Season 4 of Aikatsu, episodes 154-end, the...actually, it's just more of the Akari generation. Which is good! They didn't fall into the season 2 pitfall for the climax. And the actual climax itself was pretty great, being a story arc that lasted longer than any other since the one that capped off the first season and was a great way to end the series. Season 1, the first 50 episodes (and the movie, which was amazing), remains my favorite era of Aikatsu, but the last year and a half were certainly a worthy addition. At its best, Aikatsu was lovable, heartwarming, and maybe even a little tear-jerking. At its worst, I was shouting "NO! NO! NO!" at the screen in frustration. It had its ups and downs, but in the end it's become a series very close to my heart. I will miss the girls of Starlight Academy. Although this anime has a bit of a slow start, the story is one of the better ones that I've seen. Although it is a fairly typical coming-to-fame story, it is well done and unlike most anime that feel unfinished it keeps going until the story reaches a proper end. One very interesting thing is the cast collecting in the anime to the point that the main cast actually switches about halfway through. There are around 100 different characters and they each have interesting personalities, although some of them have unfortunately short screen times. The art of the main series is well done with the girls being very cute and are all modeled differently, which is important for such a big cast. In the beginning the dance scenes are a bit of a problem since they're bad enough to feel like carcinogens, but that is fixed later in the show. The dance scenes are actually held in virtual reality in the show and when past recordings of dances are shown on screen they have the same animation as when they were first shown so it may be that their own technology is improving making the bad dance scenes slightly more forgivable. The dances at the end have better CGI than pretty much any other anime I've seen. The music in this show is amazing. There is a total of over 70 songs and although there are both hits and misses the hits are amazing and many are top ten worthy, although partly due to the lack of insert songs in most anime. The voices were all outstanding. Oddly enough, the age gap between the seiyuu for the two protagonists is about the same as for their characters but in the opposite direction. All of the seiyuu do a good job and the ones who speak other languages add a bit of spice to the atmosphere. One character develops an even more cringe worthy version of Engrish, which is interesting to watch. With such a huge cast it's amazing that they gave every character an interesting and unique personality. There are even some characters who end up in the main cast who you wouldn't expect to because of their eccentric personality traits. The anime is about the characters and they all do a great job at making the anime fun to watch. There are sure to be some characters you won't like, but you can only hope that those characters won't get as much screen time. It's great to see the different characters from different places as they will often use this as a method for world development. With everything this anime does well it is incredibly enjoyable. As a kids show they try to decrease the character-viewer disconnect so anything the characters view as being good actually is good. There are some foods in the anime that just make you want to try them and some did have a limited availability in real life but none are available outside of Japan. Just like with anything it's more important who you're with than what you're doing so although this is just a really good rendition of a generic story the great characters and great music make it far better. With every considered this is a great anime that does not disappoint. There are still some questions unanswered, but they did a better job addressing the most probable questions than most anime do. Anime with futuristic settings are bound to have holes in their logic but this one does fit quite neatly. Whether if you like cute girls doing cute things, music anime, or even sports anime depending on your reason for doing so this should be a good anime to watch. As an original anime you don't have to worry about which episodes are filler even though the anime is on the longer side. There aren't many idol anime with over a hundred episodes, and there are even fewer idol anime that have the ability to hook and surprise you for such a long period of time. Coming in at just under two hundred episodes, Aikatsu is a series that manages to do both, and there are so many ways to describe it; energetic, revitalising, and optimistic, to name a few. But the best thing about Aikatsu is that it's able to toss its target audience aside and create something able to entertain people of all ages. Unlike Hollywood family movies or shows like Friendship is Magic, there isn't much dumbing down or simplifying of the content within—it's effective, straightforward, and surprisingly realistic in its presentation. The premise is straightforward: A school for female idols named Starlight Academy exists to seek out and train its kin, be it through acting, dancing, singing, or some other form of entertainment. Aside from an exceptionally kind headmistress and a few spunky teachers, there is no supervision or management to keep the girls in check; much like college, the primary reason for their attendance is so that they can discover who they are as a person (or idol) whilst remaining in an open social setting. Thanks to its believability, the concept itself provides you with many dramatic writing opportunities. Who are the students? What are their reasons for attending? Why are they all so interested in living a monolithic public life? These questions are regularly asked and answered, and their answers further the countless possibilities of the universe time after time. To bridge the gap between idol and school life, the staff always provides students with opportunities to get their name out and/or obtain new apparel, resulting in a rush of motivation for everyone involved. Depending on their popularity, idols can even influence the work of prominent and rising fashion designers or brands at large. Once the characters' training cycle begins, the lurking element of surprise prevents you from taking your eyes off the screen. That's not to say it's all training and no action; the fun graces you one episode at a time, so the competitions, extracurricular activity, and other unspoilable events don't seem out of place for when their time comes. In other words, the occasional slices of life flow as naturally and beautifully as the show at large. One aspect I've found to be unique to Aikatsu is its painless and beautiful sincerity; the characters have natural unbreakable bonds between one another, be they incandescent rivals or shimmering partners. It shies away from the trends of melodrama and grittiness by keeping things light and sometimes funny, completely aware of the fact that the most powerful emotional stirs are naturally-occurring. The cake is topped with a sprinkling of internal conflict, often pertaining to the difficulty of meeting one's own expectations. For a cast made up of teenage girls, they're delightfully headstrong and angst-free. That maturity spares you the clichéd nature of most conflicts within Idolm@ster and Love Live, and often gives you the opportunity to ask yourself the same questions. I truthfully believe the series is ultimately sociological, as is any great drama. That said, the show's composition resembles western TV dramas much more than it does your typical anime; the supporting characters are constantly evolving, changing roles, and moving into the picture, whilst the main characters themselves aren't as prominent as you may believe. Such traits are definitely not suited to everyone, but for anyone searching for more complex development, they are a dream come true. The continuity put on display here is fairly amazing—things you may haven't seen for dozens of episodes can slowly begin to reappear, and they always have a graceful fall into place. It doesn't sound so surprising on paper, but the practical appropriation of older content happens when you least expect it to. You'll want to trust me on this one. For the sake of performances, a fun little wardrobe transition to 3DCG is made whenever an idol needs to be on stage. But don't hold your breath! While the CG starts out on rocky ground, it goes out of its way to make some vast adjustments every few episodes. By the time you're a third of the way through, all of your gripes with its appearance will disappear. Still, it never stops making improvements, and things become increasingly gorgeous as you approach the final episode. The beauty of the CG is best illustrated during group performances, yet it also has some interesting tricks up its sleeve like flying objects and wireframe views that liven up the stage experience. Some incredible on-stage camerawork does a great job illustrating the benefits of using 3D animation, and definitely proves why the show chose to use the medium in the first place. I'm not quite sure if the show could have retained the same energy without it. Finally, let's talk about the music. Some insert songs are impeccably composed and arranged, others excel in one of those two departments, and the few songs leftover are straight-up bad. From a production standpoint, it's rather hit-or-miss, but the hits have the strength to absolve it of the misses. I even find the insert songs that are only okay to be a treat every once and a while, but due to the subjectivity of music, your personal results may vary. On the other hand, the background music is so subtle and relaxed that I doubt anyone could take issue with it. Heck, sometimes they're just little piano arrangements of prominent insert songs. It's definitely more consistent overall, and kind of sounds like something you'd hear from a modern Nintendo game or device. Kind of perfect to do work to. Point is, this review may make it sound like I think Aikatsu is exceptional and near-flawless. That's because I do. I find its weaknesses completely redeemed by the underlying strengths. I find it able to appeal to any demographic without a hitch. I find it to be of a standard that all other kids' anime should hope to achieve. If you're not sick of anime already, I would plead that you at least give it a shot. Otherwise, it's never anything remotely amazing, nor does it outright excel in any category; it was just enough to retain my interest in anime for much longer than I expected. And so as it decides to let go, I find myself doing the same. Despite what some may say just by looking at any images or promotional stuff for this series, I am not afraid to say that I have, without any regret, enjoyed Aikatsu! to its fullest! First off, the story is very simple: a group of girls aim to be the best idols by attending an academy that solely focuses on idol training. That's pretty much the gist of it. Of course, you have to understand this series is supposed to be for kids. However, there's something about watching each episode that feels satisfying. If ever I'm having a bad day, or I'm getting tired of seeing other shows that are serious and dark, Aikatsu! always brings a smile to my face. The characters is one of the aspects that makes it its own. There are a myriad of characters that we see, and they all have their own unique personalities. What's great about them is all of them have plenty of screen time to be able to get a good judge on them. With the roster they have, I'm sure there's bound to be a fanbase for each one, which is great. While the animation isn't all too special (and, likewise, there are times when we see a dip in quality), it's really more about the character designs. It's not just the personalities that make the character stand out, it's how they look. Just by looking at them, you will be able to tell who they are. Finally, we cannot forget about the music, for without it, it wouldn't be Aikatsu! in the first place. With each episode, there are songs written specifically for the show. You will hear them as the opening and ending themes or as inserts; they are performed by the fictional characters, but, surprisingly, not by their voice actors. There are so many songs, it's unbearable, and I have all of them. Every single song is so catchy, it's hard not to love them! As you can see, I'm giving this so much praise, despite it only being a kids show. But, does it have to not be a kids show in order to make it seem not weird? The show is harmless entertainment. I've stuck around with this series since episode one, and that was three and a half years ago. It shocks me that it's run for this long; I had originally thought it'd end by at least two cours. At first, I thought it was so-so, but as it went on, my love for it grew more. It even came to the point where I practically cry with each episode because of how much I love it (the last episode was no better). If you're looking for some good old fun with great characters, awesome music to dance to, and you don't care what the general audience for the show is, I'd say give Aikatsu! a shot.